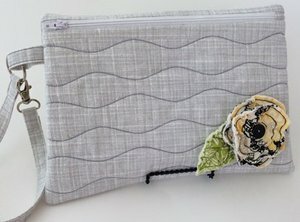 Our wristlets are professionally finished inside and out. Our wristlets are made 'in your hoop' in one hooping. They are professionally finished inside and out. The flower and leaf design are also included. 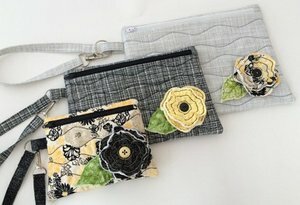 The wristlets are included in 3 sizes. 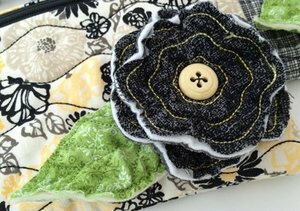 Each size includes quilted fronts and plain fronts. Our wristlets feature exclusive finishing details like these zipper tabs at each end of the zipper. You will love how nice the inside is finished - no exposed seams or visible stitching! You could add a name or monogram to them. The instructions tell you when it needs to stitch. The optional hardware looks modern & fresh. The flower & leaf add the perfect finishing detail.